Aim To evaluate the short-term economic impact of legislation removing point of sale tobacco promotional displays (ie, tobacco displays and other point of sale tobacco advertising) in Ireland, implemented July 2009, on cigarette sales across a range of categories of retail outlets. Methods Cigarette sales were evaluated using scanning (weekly data since January 2006) and audit data (bimonthly since November 2007) within different retail categories using data sourced from AC Nielsen, Ireland. Visual inspection and time-series regression techniques were used where appropriate to assess changes in sales over time and in relation to the legislation. Results No change was observed in sales data in any retail category over and above seasonal patterns and an underlying downward trend over time. Similarly, where available data enabled statistical analysis, there was no significant effect in the short term (up to 12 months after implementation) on retail sales of tobacco products, over and above seasonal and long-term trends. Conclusions Recent claims of substantial revenue losses and closures of small retailers as a direct result of the removal of point of sale tobacco promotional displays in Ireland are not borne out by these data. The removal of point of sale displays is aimed at reducing the pernicious effects of tobacco advertising on children and is therefore likely to have an impact on sales over a much more protracted time period. This should enable retailers to adapt over time, perhaps using such regulations as an opportunity to play a role in promoting healthier products in the local community. Recently, Irish retailers have claimed that retail cigarette sales have fallen 40% in the last year, as a result of the legislation.12 This followed the release of reports purporting to analyse the impact of similar policies internationally, which concluded that removal of point of sale advertising and tobacco displays had an immediate, negative impact upon retail sales in Ireland of tobacco products and other products, and affected retailer viability.13 14 We believe that these reports were severely limited in the scope of their data and their analysis. We therefore examined the available data on cigarette pack sales from different categories of retailers in Ireland to investigate the impact of implementation of the point of sale legislation. We used retail sales data collected by AC Nielsen, Ireland and purchased by the Office of Tobacco Control, Ireland. AC Nielsen's Retail Measurement Service provides data for the confectionery/grocery sector covering: ‘multiples’, ‘symbol groups’, ‘forecourts’, ‘tobacco, sweets and newsagents’/‘independent garages’ (TSNs) and ‘independents’ (see table 1 for definitions). These retail channels capture all retail outlets in Ireland except vending machine sales. Cigarette pack sales data varied between retailer categories with respect to the sample size and sample fraction, time periods and level of aggregation over time. The data came from a census of multiples (minus the Dunnes Stores retail chain, which consists of about 100 retail outlets), a large representative sample of symbols and forecourt stores, and from a small representative sample of TSNs and independents. Multiples, symbols and forecourt stores provided weekly electronic point of sale (EPOS) information from scanning of tobacco product purchases since January 2006. TSNs and independents do not collect EPOS data, but provide audit data (where AC Nielsen auditors visit retailers and examine invoices, enter purchase data and look at stocks, validating data collected for a period of the time covered). These audit data were provided in bimonthly (in 8-week or 10-week aggregates) rather than weekly segments and were only available from January 2007. Table 1 gives data on the retail universe and the sampling details and period covered for data on cigarette sales. The number sampled, n, gives the total number of stores for each category, for 2009, which is indicative of sampling for all years. We looked at changes in sales of cigarette packs over time. Weekly data from multiples, symbols and forecourts were converted into bimonthly data for comparison with the available data from TSNs and independents. Analysis of these data was limited because the data were aggregated into dissimilar blocks (as discussed above, 8–10 weeks depending upon the months which precludes disaggregation informatively into weekly data), and because, once aggregated, too few data points (and hence degrees of freedom) exist for robust methods such as regression to be feasible. Visual inspection is therefore used to comment on the patterns observed. For the weekly data (available only for multiples, symbols and forecourts), the greater number of data points (t=232 weeks) enabled more rigorous analysis to be carried out. Time-series regression techniques were used to determine changes in sales, controlling for seasonality, trading-day and cyclical variation, and secular trends in the data. First differencing (subtracting the previous week's data from any current week, such that analysis is conducted on change in sales from the previous week) was employed to factor out the secular trend. The reference category in this equation corresponds to summer, weeks preceding the removal of point of sale promotional displays and a week that is neither the final nor the first week of the calendar year. The trend is captured via differencing (Salest−Salest−1) and using two lags; time is the weekly trend (time=1,.,T, the end of the series); and seasonality is controlled for (by calendar season), as is the Christmas trading effect (‘final week’ and ‘first week’ are the last and first calendar weeks of the year, respectively). Finally, the variable POSremove is an indicator for the removal of promotional displays at point of sale. Estimation was conducted using Stata SE, V.11.15 The data were made stationary via differencing, in order that all statistical controls—differencing, seasonal controls, and so on—could be contained with the regression model parameters.16 The number of lags was selected by comparing autocorrelation and partial autocorrelation functions. Prior testing for structural breaks in the data was performed, however none were found. Finally, tests for unit roots were negative and the data appeared to be trend stationary. The data were sufficiently stationary and the model appeared satisfactorily specified for testing whether there was an effect of the legislation on retail cigarette sales. Prior to the implementation of the point of sale legislation, between 2006 and 2008, the data shown in table 1 illustrate that the proportion of multiples, symbols and forecourts in Ireland increased, at the expense of independents and TSNs that were showing declines year on year—even when accounting for some reorganisation of retail outlets within the categories. Figure 1 shows the series of bimonthly aggregated data that include TSNs and independents; the vertical reference line indicates the date of the implementation of the legislation. Trends in tobacco packs sold bimonthly across different retail outlets (source: AC Nielsen, Ireland). In figure 1, ‘Total’ gives the sum of the five retail categories. Upon visual inspection, one can observe two key characteristics of the series. First, the data are seasonal, with significant boosts in sales during the summer months. This corresponds in particular with seasonal tourism, which has also declined in recent years.17 There is also an apparent time trend in nearly all of the series: specifically, cigarette pack sales are declining. These data also show that the bulk of the sales is coming from the symbols group, with the forecourts second, despite the latter category having a smaller number of stores than the other categories except multiples. Sales in multiples are lowest although they show less of a decline and appear to surpass sales in independents at the end of the series. Figure 2 illustrates the weekly data for multiples, symbol groups and forecourts—all of which have EPOS weekly data collection; again the vertical reference lines indicate the date of the implementation of the legislation. Trends in tobacco packs sold weekly across multiples, forecourts and symbols and total electronic point of sale (EPOS) scans (source: AC Nielsen, Ireland). Different scales are used on the y axes because of the different volumes of sales in the different retail categories. In figure 2, ‘Total’ gives the total of the three retail categories shown: forecourts, symbols and multiples. Visual inspection of these graphs also show a clear decline in cigarette sales since June 2006, overall and in each of the retail categories, although less pronounced in the multiples. Seasonal effects can again be observed in the data as well as sharp spikes in late December. The end-of-year spike/trough in sales is also larger in magnitude than the seasonal effects. Seasonality is more apparent in figure 1 than in figure 2 because of the aggregation of weeks, which reduces the impact of the spike in sales at the end of the year. Table 2 contains the results for variable of interest from the regression analysis. Separate regression models were run for multiples, symbols, forecourts and total tracked scans. 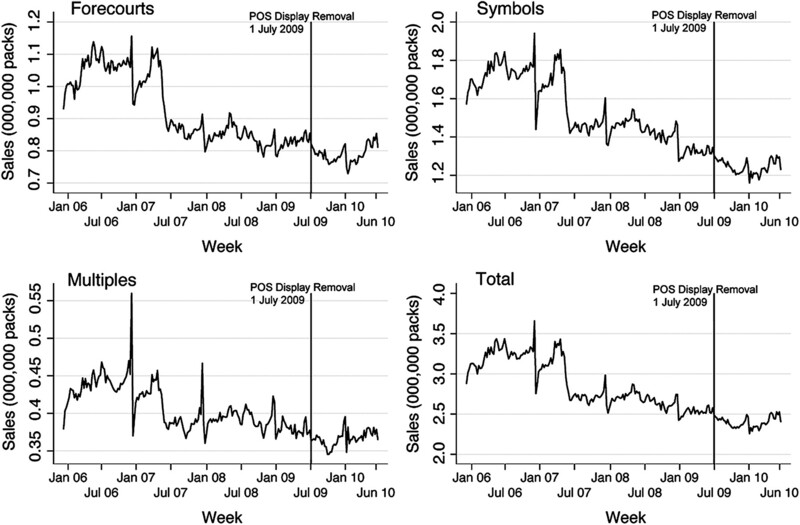 After controlling for seasonality, the secular trend and end-of-year trading-day effects seen in figure 2, there is no evidence that the removal of point of sale displays had an effect on cigarette sales. In addition, the coefficients are small relative to the means in each series: the effect of the first and last weeks of the calendar year are statistically significant and up to several hundred times greater in impact; the seasonal effects were statistically significant and with similarly larger impact. In the 12 months following the removal of point of sale displays, no impact on retail sales of cigarette packs was observed that can be attributed to the policy. This study has several limitations. TSN and independents' data were not available at the level of disaggregation suitable for time-series regression and the effect of the legislation on cigarette sales in those store categories could not therefore be tested with the same rigour as data from the other retail categories. Another limitation was that the proportion sampled for the independents and TSNs was much smaller than that of the other retail outlets, so there is more uncertainty about the data on sales trends from these store types. Other measures introduced alongside the removal of point of sale promotional displays, such as the retailer registry and removal of vending machines, may be having an impact although we believe this is very unlikely given the low cost of registration (€50) and the small contribution that vending machines play in overall sales (although larger for children). Finally, only short-term impacts of the legislation were assessed (up to 1 year after implementation), and it is possible that results would be different if followed-up after a longer spell post legislation. The downward trend in cigarette sales over the years studied is likely to be a result of a number of different factors. Some substitution for cigarette packs has been observed with hand-rolling tobacco,20 as well as illicit (smuggled, bootlegged or counterfeit) tobacco, over the last decade. Hand-rolled tobacco sales are a small proportion of the overall market (currently around 5%20) and would still benefit retailers when purchased legally. Other contributory factors to the downward trend may be implementation of other tobacco control strategies. For example, Ireland introduced smoke free work and public places in 2004, annual tax increases on tobacco products (averaging an €0.39 increase annually over the last 4 years) and a ban on packs of 10 cigarettes at the end of May 2007. The point of sale legislation was introduced during a global recession. The figures for retail grocery categories shown in table 1 indicate that the recession was affecting the various categories of retail grocery outlets in different ways. The decline in the small retailer sector has been observed elsewhere.21 Other commentators have reported that the number of retail outlets in the grocery sector in Ireland declined overall by 54.3% between 1977 and 2006, with most of this decline being in the smaller independent shops (eg, decline in independents 63.4%, symbols 18.8%, whereas multiples increased by 170%).21 The expansion of some retail categories at the expense of smaller independent stores probably reflects changes in behaviour of shoppers due to greater price competition and enhanced and broader ranges of products, particularly during a recession.22 The impact on closures of independent traders such as butchers, bakers and general stores has been documented elsewhere.23 Historically larger chains have a stronger focus on key cities such as Dublin, Belfast, Derry, Cork and Galway, where they are also better able to withstand rent inflation than independents,24 although they are opening increasingly in smaller centres also. These phenomena precede the removal of tobacco point of sale promotional displays by several years and are part of wider forces and trends and cannot be attributed to the legislation. Nevertheless, as cigarette sales may be affected by consumer trends differently in other countries, where the retail sector market might have different categories affected in other ways, the findings here are not necessarily generalisable to other countries. The argument has also been made, particularly by retail and tobacco industry groups, that non-tobacco sales are part of the losses faced by retailers, following decreased footfall as a result of decreased tobacco sales. However this would be a consideration if, and only if, tobacco sales themselves were significantly affected by the tobacco display removal, which we did not find was the case. Available data on non-tobacco sales (not presented here, but also available from AC Nielsen, Ireland) show a similar annual decline in overall sales that precedes the promotional display removal and appeared unaffected by the policy implementation. The conclusion remains that small and independent retailers are facing a broader and longer-term decline in sales generally which is most likely due to other causes. Trends observed elsewhere of sales and customers moving away from smaller independent retailers to multiple chains have prompted some analysts to comment on the attributes and selling points that such independents have, such as location and speed of service.25 We argue that the overall long-running decline in cigarette sales across the retail sector will require that all types of retailers need to adapt. Adaptation to consumer demand is one of the features of the retail sector. One way in which small independent retailers could adapt is to take the opportunity to be responsive to their local communities, for example by being at the forefront of health promoting consumer marketing and playing a leading role in their local communities in promoting healthy behaviours. Retailers could make a virtue out of having cigarettes out of sight, as this may make it more difficult for children to request cigarettes11 but they could also make available and proactively signpost cessation support to adults. In some countries nicotine replacement therapies (a much less harmful form of nicotine intake) can be purchased on general sale (ie, in non-pharmacies as well as pharmacies) and these could be promoted instead of cigarettes to encourage smokers to quit. Contemporaneous research11 carried out in Ireland has demonstrated that retailers were quickly compliant with the regulations, which were also largely effective at removing cigarette and tobacco packs from view. Recall of seeing cigarette and tobacco displays decreased significantly in adult and youth samples, with the observed drop being greater among youth than adults. There were also promising signs that the law was effective at denormalising smoking, at least in the short term, as shown, inter alia, by decreases in the proportion of children thinking that more than 20% of their age group smoked. These findings suggest that despite the evidence from this analysis of a minimal effect on tobacco sales, the removal of point of sale displays is likely to have a longer-term impact on sales as the impact on denormalisation and reduced initiation among youth take effect. In conclusion, this paper indicates that the removal of point of sale promotional displays did not have an immediate impact on cigarette pack sales when underlying trends and seasonality in the data are taken into effect, nor was there an impact in on retail closures. The disastrous effect on retailers predicted by opponents of the removal of point of sales displays has not materialised. Cigarette pack sales in Ireland are continuing to show an overall downward trend. As it is anticipated that point of sale policies are likely to have an effect over a much longer time period, a replication of this research in a few years time is recommended, to assess if the long-term decline in cigarette pack sales has been increased by the removal of point of sale tobacco promotional displays. Removal of the point of sale tobacco promotional displays had no short-term impact (1 year post ban) on cigarette pack sales. There is a general downward trend in cigarette pack sales that preceded the point of sale policy by several years, which is due to a number of other factors. Impact on sales will likely take effect over a much longer period allowing retailers to adapt over time. We are grateful to the Office of Tobacco Control for providing the AC Nielsen data and to Marie Killeen who commented on an earlier draft of this manuscript. National Cancer Institute. The Role of the Media in Promoting and Reducing Tobacco Use. Tobacco Control Monograph No. 19. Bethesda, MD: U.S. Department of Health and Human Services, National Institutes of Health, National Cancer Institute, NIH Pub. No. 07–6242, 2008.
. POP goes the power wall? Taking aim at tobacco promotional strategies utilized at retail. Tob Control 2004;13:209–10.
. Tobacco industry marketing at point of purchase after the 1998 MSA Billboard Advertising Ban. Am J Public Health 2002;92:937–40.
. Tobacco point-of-purchase promotion: examining tobacco industry documents. Tob Control 2006;15:377–84.
. More than meets the eye: on the importance of cigarette retail merchandising. Tob Control 2007;16:270–4.
. Tobacco point-of-sale displays in England: a snapshot survey of current practices. Tob Control 2010;19:279–84.
. Tobacco Advertising at Point of Sale (Report to ASH). Essex, UK: MacGregor Consulting Ltd, 2008.
. The impact of tobacco promotion at the point of sale: a systematic review. Nic Tob Res 2009;11:25–35.
. A longitudinal study of exposure to retail cigarette advertising and smoking initiation. Paediatrics 2010;126:232–8. Office of Tobacco Control. Background information on legislation. http://www.otc.ie/rg-background.asp.
. 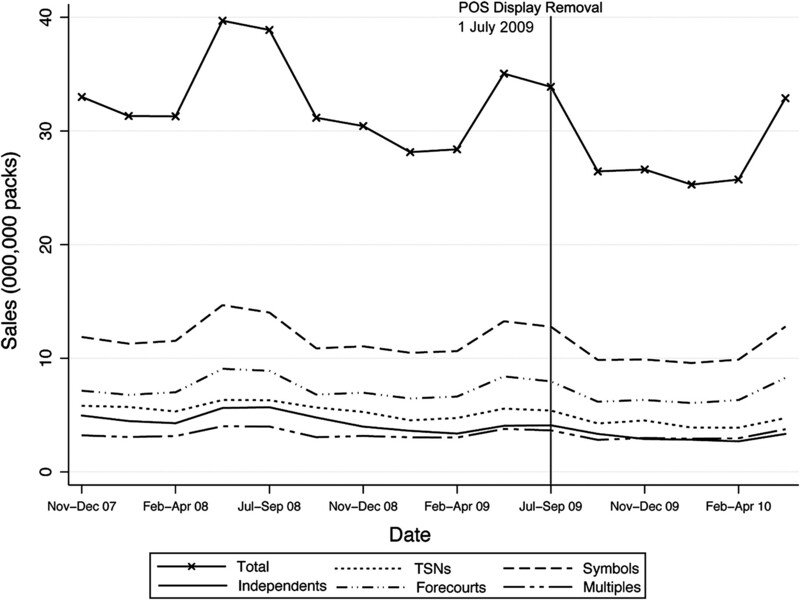 Evaluation of the removal of point-of-sale tobacco displays in Ireland. Tobacco Control Published Online First: 18 Nov 2010. doi:10.1136/tc.2010.038141.
. Cigarette Sales see 40pc Drop in a Year. Evening Herald, 2010.
. Canada's ruinous tobacco display ban: economic and public health lessons. IEA Discussion Paper 29. London: Institute of Economic Affairs, 2010.
. The Impacts of Restrictions on the Display of Tobacco Products. A Supplemental Report by Europe. Europe Economics, 2009. StataCorp. Stata: Release 11. Statistical Software. College Station, TX: StataCorp LP, 2009.
. Time Series Analysis. Princeton, NJ: Princeton University Press, 1994. Central Statistics Office. Tourism and Travel 2009. Ireland: Central Statistics Office, 2010.
. Seasonality in cigarette sales: patterns and implications for tobacco control. Tob Control 2003;12:105–7.
. Seasonality in onset of youth smoking parallels seasonality in cigarette sales. Tob Control 2003;12:339. Revenue Commissioners. Statistical Report. 2008. http://www.revenue.ie/en/about/publications/statistical/archive/2008/.
. The economic and financial significance of the ‘local shop’. Report prepared for RGDATA. Jim Power Economics, 2010.
. Ghost Town Britain. London: New Economics Foundation, 2002. InterTradeIreland. Clothing and footwear. An Ireland Retail Perspective. 2000. http://www.intertradeireland.com/module.cfm/opt/29/area/Publications/page/Publications/down/yes/id/57.
. Beyond convenience: the future for independent food and grocery retailers in the UK. International Review of Retail, Distribution and Consumer Research 2001;11:395–414. Funding We are grateful for funding from the Office of Tobacco Control (OTC) Ireland, Cancer Research UK, the Irish Cancer Society (ICS) and ASH New Zealand to support this research and analysis.